Overview of the presentation of Ginger. 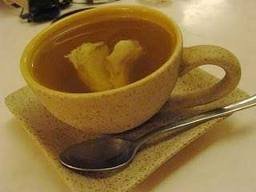 Before putting a cup of ginger cut up to medium size, wash clean, then beaten until flattened and directly enter in a cup of hot tea. If you are injured, feel pain or in the healing process, ginger can be a mainstay. Ginger can reduce pain and swelling. Ginger oil can fight inflammation and increase blood supply. This helps reduce swelling and pain. Such oils can also heal the wounds in the body. Ginger can increase blood circulation throughout the body, and lowers high blood pressure. In addition, the compound in ginger can relax the muscles that open the arteries. Thus, ginger may also reduce the risk of heart disease. Ginger is a natural cleanser and helps the digestive process. Ginger relaxes the muscles to function in digestion, so that the absorption of food becomes easier. Also, ginger can also be overcome stomach cramps, which often occur during menstruation. Nausea and dizziness often arise in the morning, or commonly known as "morning sick". Instead of taking the drug nausea, ginger is better to drink water. You can brew ginger which has been mashed with warm water and add a little sugar. Because ginger can relax the intestinal muscles are tense and creates a feeling of nausea, then it is very effective relief of nausea.